…now I understand. We’re leaving ten minutes early! Now there’s a switch. The serving crew doesn’t even speak Arabic… freelancers from Russia and the Far East. I’m heading into a different part of Arabia, where locals comprise barely twenty-five percent of the population of their own countries and English is as much the lingua franca as Arabic. 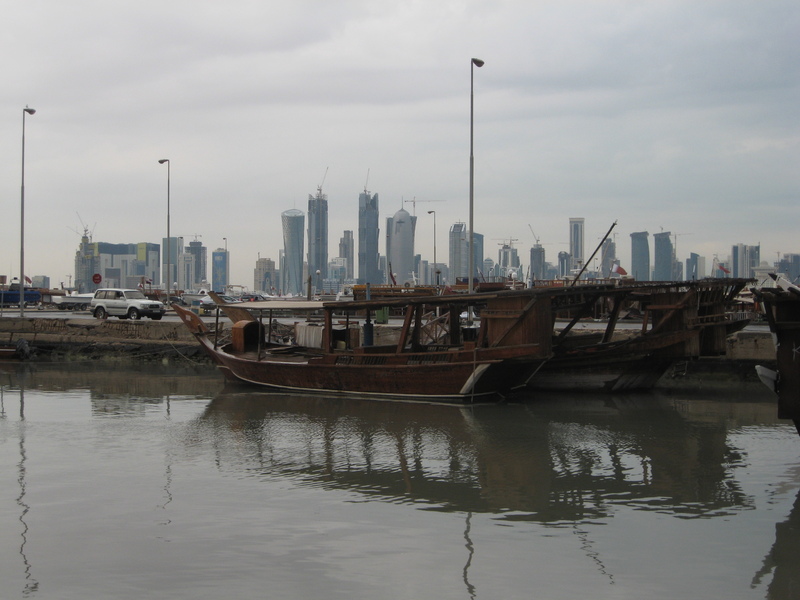 …good time to be in the Gulf, though, what with the world economy in a slump… hotels seventy-eighty bucks mere weeks ago, now forty-fifty… You gotta’ be flexible. 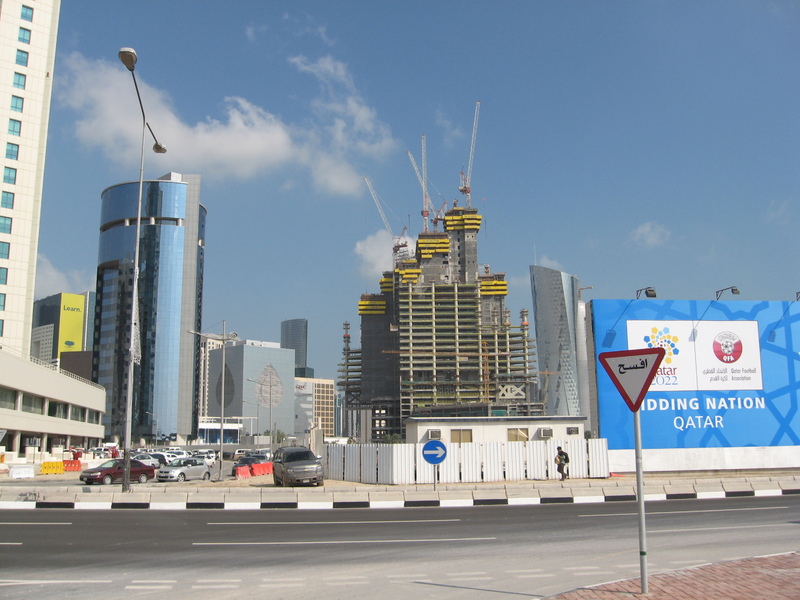 So now I’m in Doha, here because it’s on the map… very few people to share a lot of money… Qatar is the “next big thing” in the Persian Gulf, so construction of that bright shiny future is proceeding lickety-split… a schizzed-out city. Where will they find tenants to fill all the new buildings going up? …I’m staying in the old city… between Little Manila and Little Karachi… good food, and it’s cheap, if you eat where the workers eat. The touristy places in the tricked-out Souq Waqif are not cheap… only problem is that it’s raining like Hell and in the desert that only means one thing: floods. The rain finally stops… So I walk over to the other side of the bay: “Emerald City”… no one there—no coffee, no tea, no one but me…and thousands of construction workers. So what if they build a field of dreams and no one comes? …newest building appears like a corkscrew… symbolism I can’t escape: “Screw it” or “screw you.” I guess that’s the point, a point that tapers to infinity, like a dagger from Hell. It looms there on the horizon like a reminder of our collective arrogance. Dubai has nothing particular to commend it: Bangkok without the bang, or Las Vegas without the gas, shopping without the foreplay, full of Chinese and Indian immigrants, and red-faced chubby British ex-pats to make wry comments about it all. 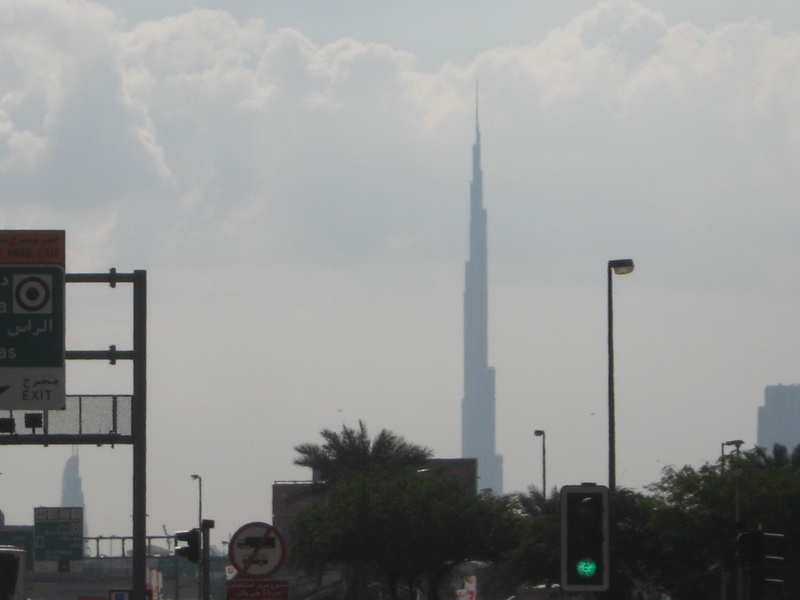 …still Dubai is more and better than I expected, not terribly cheap, but better than usual… few veils to be seen on the street, not surprising… almost forgotten that I’m supposed to be studying Arabic. Tomorrow we’ll see what Muscat has to offer. At one point I held Yemen and Oman in mind as almost equally exotic, but now I don’t know…. Thanks for dating the post – all very interesting indeed. Happy New Year!